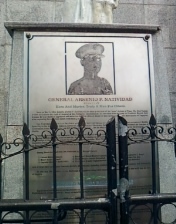 Bantayog ng mga Bayani ng Tipas serves as a memoir for the hundreds of men from Tipas who were captured and murdered by the Japanese in the prison cells of Intramuros, Manila. The victims’ names were carved on the statue. Commemorative events are also held here every February 23.